Hey guys! 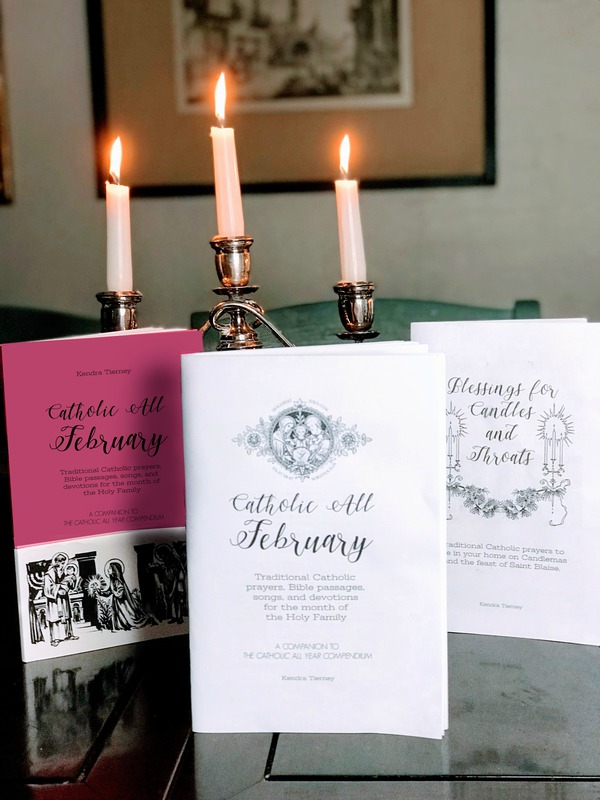 The Catholic All February prayer/devotion booklets are done! (These are companion books to the Compendium, with all the prayers, blessings, devotions, and Bible readings I recommend for the month all in one easy-to-use spot.) Check it out as a printable pdf here. Or as a paperback on Amazon here. 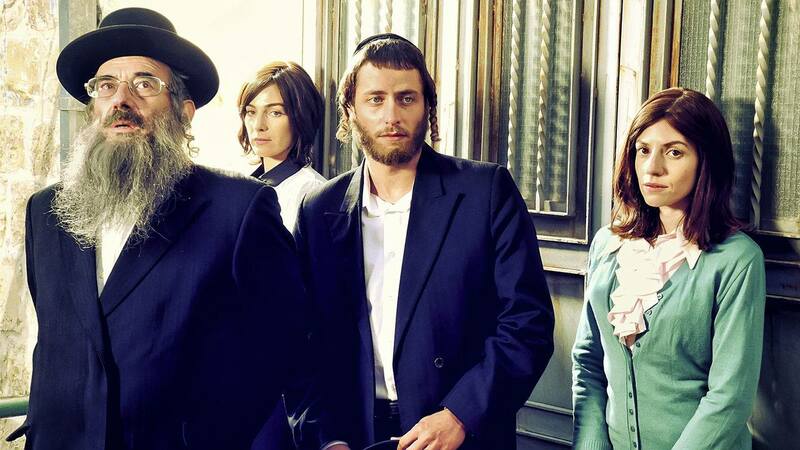 It’s been forever and ever since I did a Netflix recommendation post but I just HAVE to recommend my latest find: Shtisel. It’s an Israeli TV drama that aired in 2013 and 2015-16 featuring a Haredi family living in an ultra-Orthodox neighborhood in Jerusalem. It’s available with English subtitles on Netflix. I definitely think it’s worth watching. The depiction of ultra-Orthodox Jewish culture is just fascinating. Since watching, I have found myself more mindful of blessing ALL my food, not just sit down meals. The matchmaking process is tempting. You meet, you decide if you want to get engaged, done. I need someone at our parish to get this up and running. I love the little ways that modesty and chastity protections are built into the culture. Little things, like leaving the door open a crack, and always having a book with you on the bus. There’s a scene towards the end of the first season that I just can’t get out of my head. The main character, Akiva, faces temptation and, in the most charming and apologetic manner . . . RUNS AWAY FROM IT. It’s amazing, and so different from anything else I’ve seen on TV. There was a gap before the second season was made, and it was less of all of it for me. Less romantic, less well-written, less believable story-arcs, uncreative cameos by dead relatives rather than dream sequences, more loose ends. Still worth the time, I thought. Overall, I really enjoyed it, and it made me think of our old neighbors, and the story of my life of crime/as a shabbat goy. Over our back wall lived a family with eight kids (we had three at the time). One Saturday, our family was heading to a picnic at a college. We pulled out of our driveway and around the corner towards these neighbors’ house. It was a pretty long drive and I wanted the kids to sleep in the car, but had forgotten to adjust their carseats into the recline position, so I asked my husband to stop and he got out to fix them. When she saw us pulled over in front of their house, our neighbor came to the door and motioned for my husband to come and talk to her. When he came back to the car, he had a delivery notice, her driver’s licence, and the following information: They were planning a trip to the Holy Land and were supposed to be leaving the next day, she had recently given birth to their eighth baby, and had had to wait to apply for his passport until after his birth. They expedited it, but it hadn’t arrived the previous week as they were expecting. Instead, it had arrived via an overnight delivery service that morning. On the sabbath. So, despite the fact that their flight was on Sunday, and the delivery service office was not open on Sunday, she couldn’t sign for the delivery because writing two or more letters is forbidden on the sabbath. So the delivery guy had left with the passport. Thus enlightened, instead of heading to our picnic, we drove to the delivery office, where I signed her name, picked up the passport, and brought it back to her. We made it to the picnic, better late than never, and they made it on their pilgrimage the next day. I don’t remember if the kids fell asleep in the car or not. That was the beginning of my life of crime. But on the other hand, what a beautiful example of trust and the power of prayer. She followed the law, even when it seemed that it would mean a huge sacrifice. She couldn’t have called us on the phone on the sabbath, she couldn’t have walked over to our house carrying her driver’s licence or the delivery slip on the sabbath, she couldn’t have rung our doorbell or knocked on our door on the sabbath. But there we were, stopped outside her house. We got to be a part of her miracle. It all worked out in the end (and a lawyer friend assures me I didn’t even actually commit fraud since I had her permission to sign for her). So, anyway, I am very grateful that Jesus, at the Last Supper, fulfilled the old covenant and established the new covenant. My salvation is not dependant on my observation of a weekly day of rest . . . but that doesn’t mean there’s not a lot of good to be found in those traditional observances. I enjoyed getting to see some of them again, and some for the first time, in Shtisel. I think my fellow “observant” Catholics would enjoy it too. Have you seen it? What did you think? I’ll have to watch it! I think you might enjoy “My Name is Asher Lev” by Chaim Potok, or perhaps you’ve already read it? My Name is Asher Lev is a wonderful book. There is also a sequel to it, the name of which escapes me right now. Chaim Potok also wrote “The Chosen” and “The Promise”, the latter of which is a sequel to the first. They’re about two boys, one in a very ultra-Orthodox Jewish family, one in a not-as-Orthodox, and their unexpected friendship that arises. Just as good, if not better, as Asher Lev. This resonates with several of my most memorable life experiences–both acting unexpectedly as a Sabbath goy, and going to extremes to obtain a newborn’s passport on the day of an international flight . . . so weird! I’m excited to learn about this series–thank you so much for recommending it. And you are going to LOVE the two films I have to recommend to you. “Arranged” is an indy film set among Orthodox Jews in New York and based on the true experience of one of the producers, an Orthodox Jewish woman. “Ushpisin” is an Israeli film with subtitles. Both are EXCELLENT and great to view with teenagers. I LOVE “Ushpisin”! Cannot recommend it highly enough! Okay, more for the list! And that sounds VERY stressful! I’m glad it worked out. We made similar observations when watching “Fiddler on the Roof”. Looking forward to checking out Shtisel. Thanks for the rec! There is a short Israeli-Hebrew film called the Women’s Balcony that I think you’ll love too (I saw it on Netflix a while back). 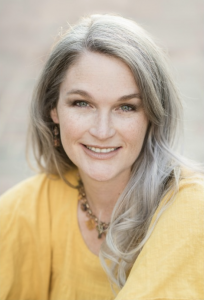 Hi Kendra, I just want to say – as an observant Jew and long time reader (I’m in it for the big-family stuff 🙂 ) I really appreciate that you wrote this in a way that was both deeply true to your beliefs and perspectives and also totally respectful of mine. So just a quick thank you, and all the best to you and yours. Whew! Thank you. I’m so glad to hear it! This definitely is something I’ll watch! Years ago I was a leader with La Leche League and met some wonderful women that were Orthodox Jew. As my friendship grew with one in particular and we became close, I joined theor LLL group and was able to experience so many of their traditions firsthand. For many years my friend and her children raised sheep and they were always ready to lamb around Easter. Many a Holy Saturday was spent with my kiddos driving to the farm in our van to check on the ewes, and one year we drove to my friend’s house to get her and take her to be there when one was giving birth. One major memory I have was shortly after her oldest stopped attending synagogue, following their faith. My friend told me that we, devout Jews and Catholics, and our children, are the biggest target of satan because of our trust in God. Yes, on season 1 episode 11 now. Sorry to hear that season 2 is not as good. Fascinating show. Coincided with my first attendance at a Bar Mitzvah yesterday. I loved the prayers. Barukh ata Adonai Eloheinu. It was so personal to the child, in contrast to many Confirmations (not to but still). Thank you for the recommendation! That is a wonderful story. I love being part of other people’s miracles ❤️ I mostly watch tv while doing something else, so subtitles are a problem, but I might have to make an exception. I loved reading this blog post!! I really appreciate how respectful you are of other religions and how you find similarities instead of just differences. I’ve followed you on Instagram for about a year, despite being neither Catholic, nor a wife/mother (I grew up Lutheran and now as a 25 year old attend an Episcopal church) but I love your passion for your faith and your commitment to being respectful and kind to others from different religious backgrounds. Plus I love your insight/explanation of the liturgical calendar! Thanks for sharing a slice of your life with all of us (even those of us who probably aren’t your target audience)! Aww, thank you. I’m glad you’re here! I just discovered this show and I love it so much! I learned the actress that played the bank manager now lives in LA with her husband and son and is involved in American production s. As a got growing up in the Bronx I was really able to relate to this series. Amazon Prime also has a similar series set in Jerusalem. I kept seeing the thumbnail for this show, but never clicked on it to see what it was about. Needless to say, even though it’s only 2 seasons, it’s a show I’m so glad I got into. Kept hoping the widow would show up in second season and Kive would take exhibition to London. This is a highly recommended show and no doubt about it that I’ll start the series again by mid week. Wish it lasted more than 2 seasons though. Can someone tell me what happened to original mother from 1st season?! Did she pass in real life? ME TOO! I assumed that’s what they were doing with randomly having the cousin, Libbi, making demands that not only weren’t consistent with her character but actually contradicted who she was when we first met her. So odd. I’m 100% Team Elisheva. In my resolution, he ends up with her in London. And yes, the actress who first played the grandmother died in 2014. I loved the first Grandma. I could see Libbi at first being in awe of Kiva’s talent, but then insecure when she thought it could become a threat, veiling that behind her Father’s bargaining chip. Ok, I finished season 2. I thought it was better in some ways, and worse in others than season 1. I was struck by the everyday and intentional “un-sexiness” of the characters – not that they were not attractive – but that the did not use mannerisms I think we take for granted in the secular world, like smiling, squinting eyes, joking, etc. The actress who played Libi did seem much more expressive than the other women – was that intentional? It felt inconsistent with their world – was it because she was from Belgium? I loved Elisheva’s character, but my takeaway was that she absolutely did not want to get married, but is open to having a full relationship with Kiva in secret. Maybe she would only be interested in marriage if they left their ultra orthodox world together. What do you think? Yes! I looked a lot up while watching Shtisel! I have to admit that the watching of this fantastically deep and elegantly crafted series has reached into a deep well inside of me. In a world full of hate and disrespect, this series seems to level the playing field for us all, as it presents Ativa’s journey along with presenting his and his family’s flaws. It also displays their fortitude. The series has prompted me to be more circumspect with my own individual perspective, and also allow myself and others to be human. It seems to present a dichotomy, as it highlights the dangers, yet also the values of living a life of Faith. I agree that the second season is weaker than the first, almost like they became lost in the process. I have two more episodes left in the second season, the last one I ironically watched the day you posted this, the day of a spectacular full lunar eclipse. I found your post while searching to send the Shtisel link to friend. Thanks for your comments! I’m in the middle of it now… I love it. I’m fascinated by their culture- I’ve read many books concerning their way of life. I give them so much credit for being able to carry on with their traditions in today’s world. Hi Kendra, I’ve been a fan (and lurker) for years now! As a Jewish reader, I have a couple of comments. I appreciate your effort to be fair toward and appreciative of Judaism. However, as a Jew your comments did not feel quite fair to me. First, I can understand that the laws of Shabbat in particular feel arcane and oppressive to you. However, for those of us who live it, it’s not oppressive at all but the greatest freedom to live one day a week as if the world were redeemed. The rules about writing, driving, and spending money are bedrock and completely natural to a religious Jew. From a Jewish perspective, aspects of Catholicism appear oppressive and difficult (for example, the prohibition on divorce, or as the wife of a rabbi, the requirement of celibacy for clergy), which I’m sure appear fundamental, meaningful and even freeing to you. It is normal to experience others’ rules as foreign and more oppressive than your own, but you do not only describe your experience, you also invoke Scripture to support the view that the laws in Judaism are an arcane and oppressive yoke. This is a kernel of supercessionism, which has been a basis for anti-Semitism and suffering for Jews for centuries. Second, on the basis of your experience with one family who asked you to do an onerous favor for them, you conclude that Jews are “willing to inconvenience others” for their faith. I would never ask you to do what this family did, and I can’t imagine anyone I know doing that either, unless the non-Jew was a very close friend who they knew would be happy to do it for them. (Actually, their asking you directly to do the favor and handing you items such as a driver’s license that cannot be used on Shabbat is questionable within the laws of Shabbat.) Taking one example of the actions of one person and generalizing them to an entire group of people is the basic move of prejudice. I really hope your readers do not conclude that all or even many Jews are willing to inconvenience others for the practice of their religion. I know I’m late commenting here…I just realized I have been missing your blog posts since Christmas. 🙁 Anyway, my husband and I try to go to several films during the Atlanta Jewish film Festival every year. They’re so different from the usual Hollywood drivel and we have enjoyed a variety of documentaries, historical dramas, and bio-pics. In fact, last night we looked up one from last year’s program guide that I had wanted to see and it was finally on Prime. I am sure we will enjoy Shtisel!